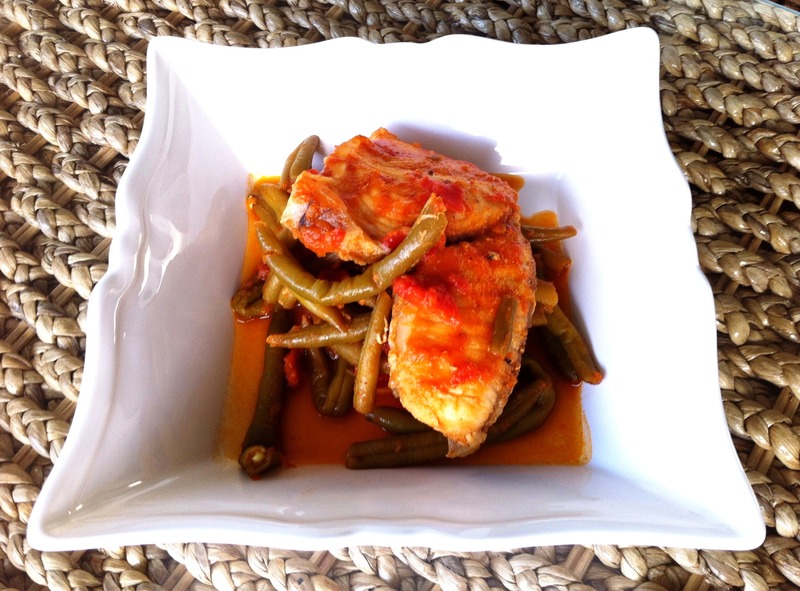 Greek Green Bean & Tomato Stew – Shark is Optional! One of the traditional Greek dishes my mum learnt and used to make often when we were kids, is Fasolakia. The word translates to “little beans” and refers to the long green ones. 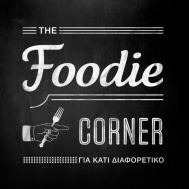 The way they are cooked here in Greece is in a tomato sauce, often with potatoes and carrots. It can also be made with beef but we never had it that way in our house. This was a great kid-friendly meatless dish, always eaten with loads of feta cheese and bread to mop up the sauce! It’s very good. The other day I thought I’d make us some Fasolakia as it’s so easy and healthy, and Dukan friendly too (if made without potatoes). Following a recent success, when I decided to serve fish alongside a tomato based dish, I thought I’d try this out paired with the leftover shark in my freezer. My intention was to make the Fasolakia and then fry the fish lightly and serve them together. When I got the packet out of the freezer I glanced at the recipe on the back and saw that it was for something quite similar cooked in a saucepan. So I decided I would experiment some, and lay the fish on top of the beans half way through cooking. Since fish cooks so quickly and easily I thought the steam and heat from the veg would do the trick. Sure enough, the fish cooked beautifully and gave lots of flavour to the beans beneath it. The resulting dish was definitely not traditional, but it was tasty nonetheless. Next time however I’ll be sticking to the original green bean stew, but that’s purely because of objections from a certain Mister, whose favourite food was apparently vandalized by this foreign concept of experimenting. If it ain’t broke, don’t fix it, that’s his motto! Add the oil to a medium-large size saucepan (that has a good fitting lid), and warm it over medium heat (or just heat the pan and then add the spray if you’re using that). Cook the onion gently, until translucent. If you want you can sprinkle some salt on it to prevent it from browning. Add the carrots and stir until coated with oil. Cook for 2 minutes. Add the frozen beans (no need to defrost), turn the heat up to medium high, and stir well so they all get coated in oil. Cook until the beans have become shiny and wet looking, about 4-5 minutes. They should now have started to soften. Add the tomatoes (with juices from the tin) and tomato paste mixture. Don’t worry if the beans aren’t completely covered by the liquid. Add paprika, salt & pepper and sugar. Give it a good stir and wait for it to come to the boil. When it boils, turn the heat down low, cover the pan, and simmer for about half an hour, stirring a few times. You might find that it’s simmering pretty wildly (mine does even on the lowest setting), in which case after the first 20 minutes tilt the lid to the side leaving a small gap, this helps. From now on you want to be checking the liquids fairly frequently. If it’s looking very soupy, leave the lid off. If it’s more saucy looking and thick, leave the lid on with the gap and add a little water if and when necessary (no more than a ¼ cup at a time). Cook for approximately another half hour, stirring well once in a while. Note: Here in Greece most people like the beans very soft, almost falling apart. If you prefer they have a bit of bite, start taste testing them after about 45 minutes of total cooking time. All the above plus 3 pieces of white fish. Choose a sturdy one that won’t disintegrate in the pan, Blue Shark is what I used, Cod and Swordfish fillets might also be good options. Or any other type of fish fillet you feel would hold well. If you want to try this variation, start with steps 1 to 5 as above. While the beans are simmering, rinse and pat dry your fish pieces, using paper towels. Sprinkle them with some salt, and pepper if you like it. At step 6 open the pan, take some beans and tomato sauce out and pop them on a plate. Make sure the bottom of the pan is still completely covered with veg and sauce. Gently place your fish on top of the beans, and cover with the rest of the beans from the plate. Stick the lid back on the pan (no gaps). Let the fish cook like that (with the lid closed) for about half an hour. Check once in a while to see what’s going on under there. If it’s looking short of juice add some hot water carefully, trying to miss the fish. It shouldn’t need it since the lid will be on and the steam will stay in.